"How to sew a quilt"
The beauty of the log cabin quilt lies in the laying out of the colors. Dark on one side and light on the other. Than the squares can be arranged in many ways creating light and dark. A great deal of this blocks effectiveness lies in the manner the squares are put together. For instance, the quilt is stunning if the blocks are made as shown here and than set together with the blocks all placed in exactly this fashion. Dark fabric strips on one side and light fabric strips on the other. This gives a line of dark across a whole row and the dark triangle is always in the upper left with the light triangle in the lower right of the series of squares. Sometimes the blocks are set in blocks of four with the block as given here representing just one fourth. This large block when finished will have the entire outer line of dark with the light triangles forming an inner square within the dark frame. The small center square block “G” should be cut of dark material and then the second “G” should be of some striking color which accents the whole block. The quilt is effective if the second small square, block “G” is made of the same material in all the pieced blocks. There is only one block “A” while there are two blocks of all the other letters. Also, “A” “B” “C” are given just half the length they should be. Be sure to lay the dotted line on a fold of the material. 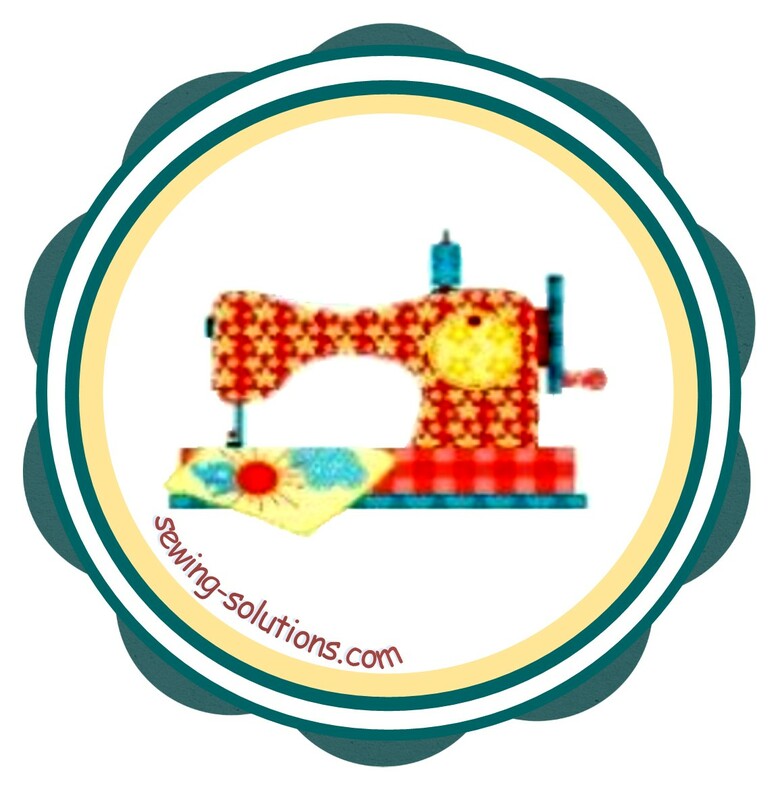 A ¼ inch seam allowance is made in these patterns. Width of each strip is 2 ½ inch. Each strips length will depend on the section you are working with. You can sew and cut off the length as you assemble. 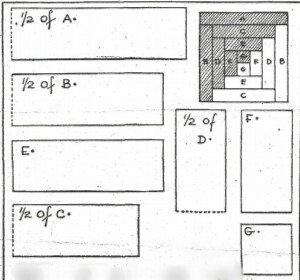 If desired the “A” and “B” blocks may be cut from one material for the dark part of block. “D” and “C” likewise and “F” and “E” also. 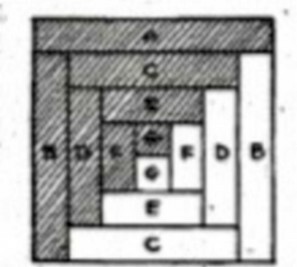 Do the same thing for the light block, or make all the light ones but center “G” of white and vary the dark ones according to scheme just given. 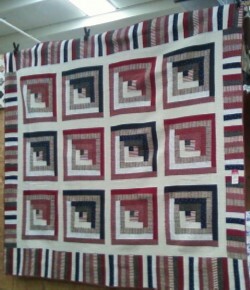 When completed in this manner the quilt uses up scraps of material you have on hand. This is a great way to use up those left over pieces and not having to cut each and every length. It is important though that you keep each strip 2 ½ inches wide. Length can be adjusted while sewing.